or book will be substantially delayed (months). Selected Poems from Baudelaire's Les Fleurs Du Mal is Helen Palma's long-awaited collection of translations. Helen Palma has accepted the challenge...sometimes declined: to turn Baudelaire into rhymed, metered lines that approximate the French forms. She has accomplished this with spirit and admirable fidelity. Palma has collaborated with Baudelaire's muse to create English poems that masterfully blend those hallmarks of post-romantic symbolist poetry...Baudelaire is well-served by Helen Palma's English versions...she once again bears witness to the axiom that to translate poetry successfully one must not only be a good translator, but a good poet..
Superbly surpassing such illustrious predecessors as Roy Campbell, Robert Lowell, Arthur Symons, and Richard Wilbur...Palma reenacts the eloquent splendor of his splenetic elan. 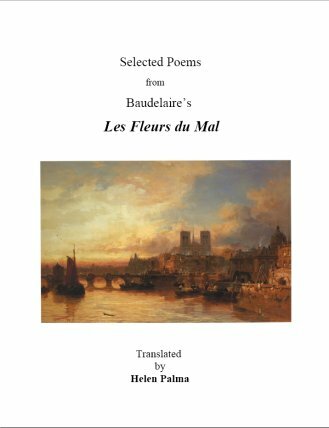 Expansive Poetry & Music Online Bookstore is pleased to present Helen Palma's Selected Poems From Baudelaire's Les Fleurs Du Mal, published Pivot Press, and available at US$15 plus applicable tax (NYS customers only) plus shipping for domestic (U.S.) delivery or International&. If you didn't order above, scroll back and click Add To Cart. If you wish to order more than one copy, or find you have ordered more than you wanted by mistake,change the quantity on the shopping cart page. Use E-mail ordering ONLY if you don't wish to pay for this book online.